Cancer Patient Brochure This brochure describes the ways that wood smoke is particularly dangerous for cancer patients and steps that can lessen their exposure. Wood smoke may raise lung cancer risk, Chest, July 2005. "... our findings demonstrate that wood smoke could produce similar effects on p53, phospho-p53, and MDM2 protein expression as tobacco. It is important to consider wood smoke exposure as a possible risk factor for the development of lung cancer in nonsmoker subjects. JAMA Abstract : Lung Cancer, Cardiopulmonary Mortality, and Long-term Exposure to Fine Particulate Air Pollution. Toxins from wood smoke inhalation sit in the bladder and can cause cancer of the bladder.Urinary Monitoring of Wood Smoke Exposure. Pancreatic Inflammation: Wood Smoke Induced Exocrine pancreatic pathology. Dioxins and furans are some of the most toxic chemicals known to science. ... The EPA report confirmed that dioxin is a cancer hazard to people. When you burn wood you produce dioxin. A recent Lawrence Livermore study found that while wood burning was the third largest source of dioxin in many cities in the United States, for the San Francisco Bay area it was the second largest source. In February of 1995 the U.S. Consumer Product Safety Commission received a report on indoor carcinogenic pollutant emissions from EPA Phase II Wood Stoves: Normalizing for the rate of wood consumption during each test, the average Benzo[a]pyrene (B[a]P) source strength is 32 ng/kg of wood burned. The average Polycyclic Aromatic Hydrocarbons (PAH) source strength is 360 ng/kg of wood. This is the exposure on average to the user. The neighbor of course gets the brunt of wood smoke pollution. (NISTIR 5575) U.S. Department of Commerce. 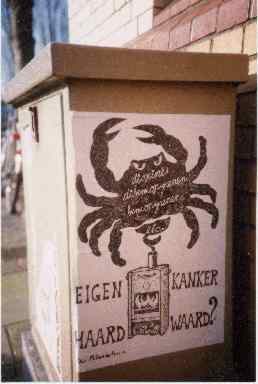 This Outdoor Poster against wood burning stoves is showing a crab as a symbol for cancer was sent from Holland in the 1990s.